Editorials from Theslowlane: Waterfront Theme Park: "The Pulp Mill From Hell"
Waterfront Theme Park: "The Pulp Mill From Hell"
I had a vision from the future of Bellingham's Central Waterfront. It wasn't as easy to find buyers / tenets for the waterfront redevelopment as many had hoped (or feared), so the port district decided to make the old pulp mill buildings into a haunted house. A haunted for house for fund raising purposes. Let's make it a scary theme park. 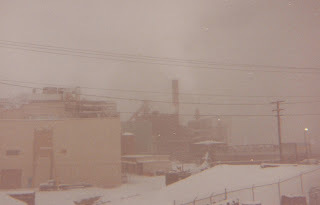 Call it, "The Pulp Mill From Hell." People came to from all over. The same folks who went to horror movies. There was the chipper blade to avoid, so as not to get ground up. Exhibit B: A monster cloud of chlorine gas wiping out the city. Then, remember that skeleton found in one of the boiler chimneys, back in the 1980s, I think? Still no one knows who that was, as far as I have read, and the ghost can still roam the park. There was even a tiger roaming around, on loan from the San Francisco Zoo. Plenty of lore and some fantasy for a fantastic theme park. Ever tried conveyor belt rides? The theme park was "world class," "extreme sports," but then I woke up from that nightmare.